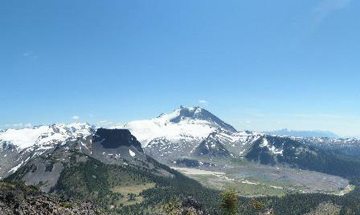 Warren Glacier in Garibaldi Provincial Park, British Columbia, Canada terminus retreat has been observed for over a century. A period of extensive retreat from 1890-1964 was followed by a period of minor advance from 1973-1977, and then rapid retreat from 1977-2009. Johannes Koch has documented this retreat in the map below and with the historic images as well, the work has been published with less colorful graphics (Koch et al., 2009).
. 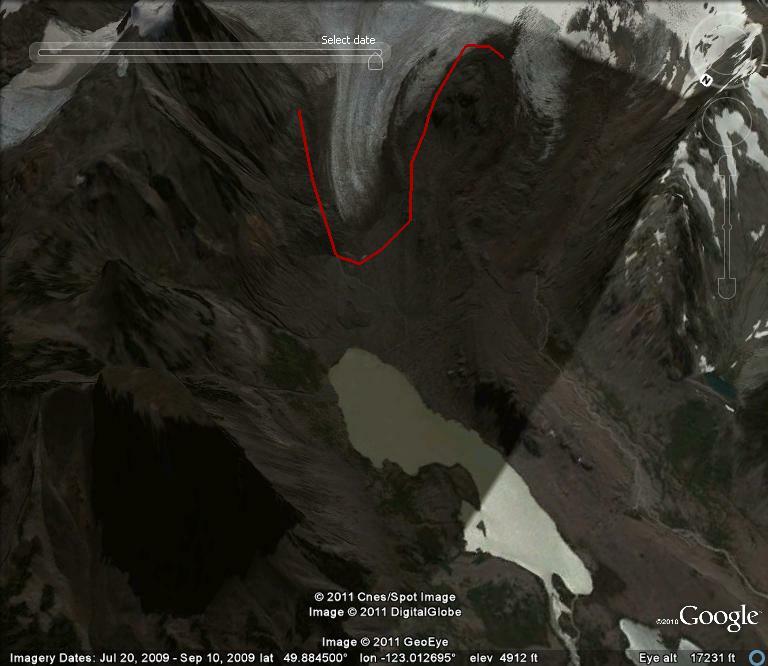 When I first saw the glacier in 1986 it had just retreated from the edge of the lake. 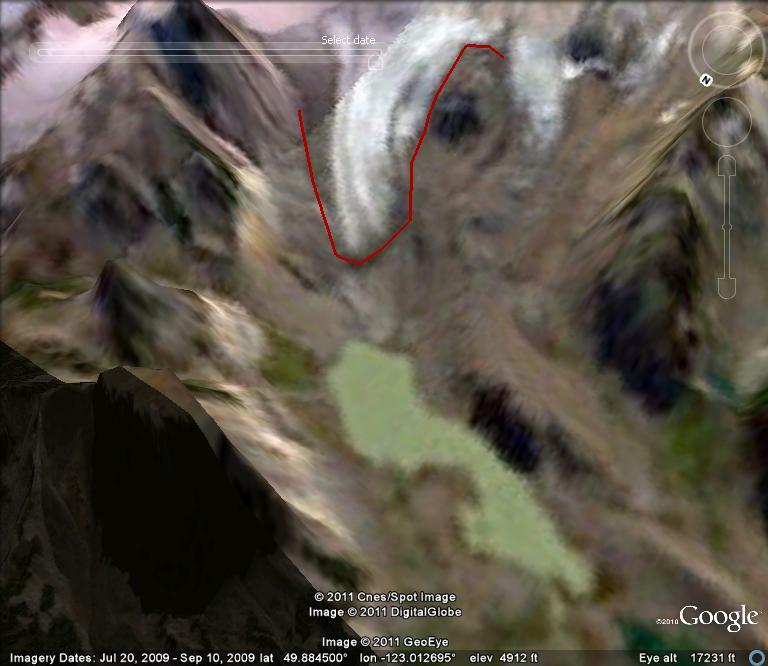 By 2003 as seen in the somewhat blurry satellite image below, the glacier was 310 meters from the lake edge. 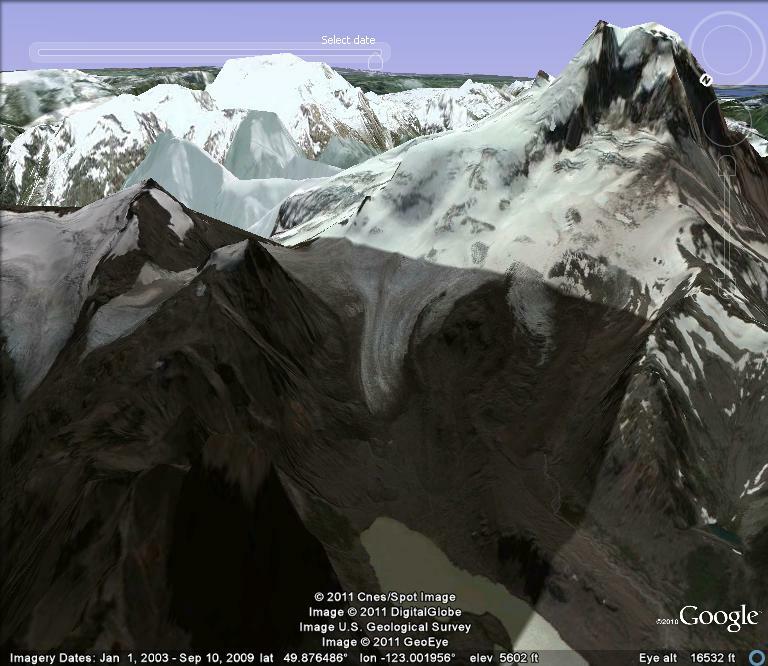 In the 2009 Google Earth image the glacier is 500 meters from the lake edge. The rate of retreat over the 25 year period is 20 meters per year. The rate of retreat has again increased from 2003-2009, being 32 meters/year. The upper section of the glacier has unlike nearby Helm Glacier maintained some snow covered areas even in poor snow summers such as 2005 and 2009. This suggests the glacier can survive current climate with further retreat. 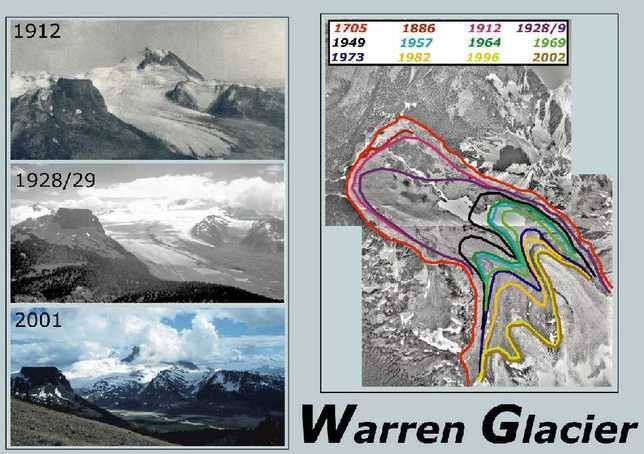 The average thinning of Warren Glacier is similar to that of Helm, Sphinx and Sentinel Glacier at nearly 50 meters since 1928, note Figure 14 (Koch et al. 2009). This thinning due to ongoing negative mass balance has led to a 50% reduction in area since 1928. The large area loss as a percentage reflects the large relatively flat low lying basin now occupied by the lake.